Learn about the temperament and personality of the Briard. Discover what he's like to live with, his traits and characteristics and how he generally behaves. And look at lots of Briard photos. The Briard is a herding dog, bred to work, but because he also thrives on human companionship, he makes an excellent family pet for the right family. The Briard is an independent thinker and requires patient training. A Briard parent must show the dog who is boss early on. Once the pecking order is established, a Briard will possess an ardent desire to please his master. They are smart dogs, often understanding many of the words people say. They are usually easy to housetrain. They are athletic, agile, and fast, and enjoy agility, carting, herding, tracking, and obedience work. They also enjoy jogging, hiking, camping, and swimming. They like to play in water, whether lake, pool, or mud puddle. These are dogs who need to be busy and active. They are very high-energy and need daily exercise. They love to play outdoors with their people, but when the day is done, they will insist on following you inside. In fact, they will follow you everywhere. They will lie on the bathmat while you shower, go for rides with you in the car, and want to sleep beside you. No matter their size, they think they are lapdogs. Human contact is essential to their wellbeing. If you don't want a dog underfoot, you don't want a Briard. Also, their beards get dripping wet, and a Briard is known to take particular pleasure in resting his big head in your lap just after taking a nice, long, cold drink. He doesn't care that you are wearing a new suit or skirt. Because they take their companionship responsibilities so seriously, they are not prone to wander off. They have a protective, guarding instinct, and make excellent watchdogs. They have great hearing and may be wary of strangers. They are rarely problem barkers, but they will quickly announce a threat with a booming bark, and will then place themselves physically between their people and the threat. They are especially protective of children. They have been known to stop parents from spanking their children, and to refuse strangers from approaching children. This instinct can become dangerous when the Briard sees your child's playmate as a threat. These are big dogs who may try to herd your children (or you) by bumping, or even slamming, into them. Briards have been known to herd unruly children into their bedrooms and then keep them there. In the right home, the Briard-child combination can be magical, but the Briard must be trained to accept all members of the family as leaders, not as pack members or sheep. Some breeders refuse to sell to homes with children, but many, many Briards have done just fine with families, as they are devoted to their people and never too old to play. They can do well with other pets in the house, especially if raised with them. Because this is a dominant breed, socialization is imperative. An unsocialized Briard can become overprotective and aggressive. Temperaments differ widely within the breed, but Briards always have big hearts: faithful, gentle, powerful, vigorous, alert, wise, and fearless. They consistently show spirit and initiative. They are very sensitive to their people's feelings and they are loyal and loving. They can be home in the city or the country as long as they are with the ones they love. The Briard is intelligent and quite easy to train. He learns new commands quickly at an above average rate. The Briard sheds a fair amount of hair. You'll find hair stuck to your couch, carpets, clothes and everything else in your home. 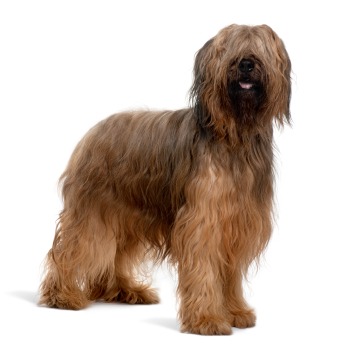 The medium-length coat of the Briard requires brushing a few times a week to keep it tangle-free.